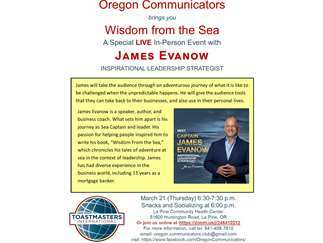 In "Wisdom from the Sea" James will take the audience through an adventurous journey of what it is like to be challenged when the unpredictable happens. He will give the audience tools that they can take back to their businesses and also use in their personal lives. James Evanow is a speaker, author and business coach. What sets him apart is his personal journey as a Sea Captain and leader. His stories are both captivating and inspirational.